My Epiphany Hymn “They Sought Him by a Star” with music. Back in 2001 I wrote the lyrics to this hymn for Epiphany. We are going to sing it Sunday at the church I attend in Stockbridge, Massachusetts. This hymn has only been sung a couple times before, once in Pittsfield right after I wrote it, with lovely original music by Lou Steigler, and once at Green’s Farms Church in Westport, Connecticut, where the then minister of music, Eileen Hunt, set it to Darwell’s 145th. I look forward to hearing it this way for the first time. Thanks to Ron Hanft for matching up the lyrics with the tune for the bulletin. It is copyrighted to me, but you may use it with attribution. We Glorify Your Name, O God! We Glorify Your Name, O God. Through Christ, your Word made flesh. To hear your Good News fresh. We care for each the same. To spread peace, love and joy. Of people young and old. Your story must be told. Ones we know and others. Until the worlds are done. (I wrote this in 2004 based on the Mission Statement of the congregation I was serving at the time. Like many of my hymn texts it is “open,” which means it is not attached to any particular tune. It is in Common Meter and can be plugged into any C.M. tune. If you try it and like it let me know which tune you have used. “In hymn singing the worshiping self experiences transcendence as one among many within a congregation. There, in worship, God the other is addressed by the singer, not in isolation, but as one voice among many others. The hymn singer uses the body as well as the intellect in an integrated act of worship engaging the whole self. Hymn singing also roots the worshiping self within the life of the congregation among whom the singer works and plays, rejoices and weeps. 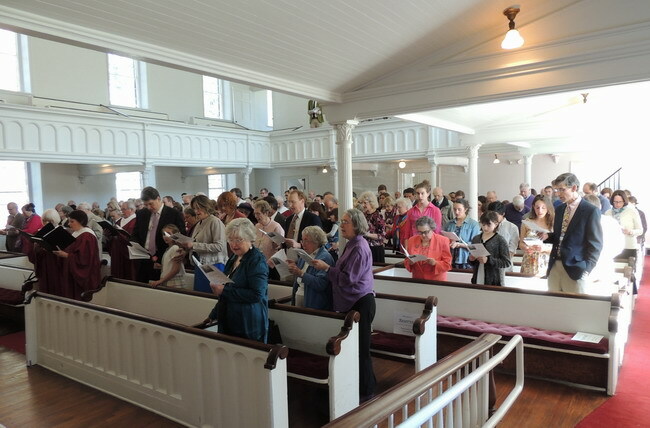 Since the congregation is the local embodiment of the church catholic (what P. T. Forsyth called “the great church”), the hymn singer is part, not only of the congregation physically present, but also the great congregation, both the ecumenical church in its geographical breadth, and the communion of saints in its temporal length across ages and generations. Singing can help faith, for sometimes we can sing words that we are not yet able to say. I have often noticed singers in choirs who would not call themselves believers belting out sacred music as if they meant it. When I was a child it was the very foreignness of the church that intrigued me. There I learned about what Karl Barth called “the strange new world within the Bible,” a world where a shepherd boy could slay a giant, where angels appeared and made strange promises, where a virgin could conceive and bear a son, and where a brutal execution was somehow seen in Easter light to be nothing less than the victory of God. I was fascinated by the language. What was one to make of such language? Long before I had a theology of the atonement I sang those words passionately. I still do. And then there was the music: the strange modal sound of plainsong, the emotion of gospel, the pathos of spirituals, the stately progression of chorale tunes. In my childhood our preachers had other, better gifts, so I learned my faith from singing it and hearing it. I knew this was a different world and in many significant ways a better one than the world I inhabited at Norwood School #2, where the big kids might decide it would be amusing to kick the living daylights out of me at recess. So let me suggest that “enhancing OUR song in the new century” will mean attending to this alternative world. And I think increasingly so, as the values of a global consumer society and the values of the church of Jesus Christ part ways. Walter Brueggemann suggests, rightly I think, that the best biblical analogy for church life today is the Babylonian exile. Christians today live as dispersed aliens in a foreign world. Constantinian Christianity is gone for good. And in America the day is over when the Protestant mainline is seen as the golden thread in the seamless robe of culture. We are increasingly marginal to what really matters in the eyes of the world. Or at least of the Empire. By the Empire I means the official normative construal of the world—the world as seen on TV. For advertising is the liturgy of the Empire. Take Nike’s ads. They hold out the world of the competitive autonomous individual, free from community, free from tradition, free of constraints, and free from fair labor practices. “Just do it!” If you don’t think that is a counter message to the Gospel, listen to this: There is a T-shirt that says: “The meek shall inherit the earth” on the front. On the back it says, “Yeah, right! Just do it! Nike!” Now that’s Babylonian!! On the one hand we take out something old. The church is a community of recollection. It has a culture, whose roots are in scripture and whose development has grown out of tradition. It wasn’t born yesterday, and for us to think that we are wiser than previous generations just because we came later is the silliest form of hubris. The church is a foreign country and its language takes learning. Some church people today are like American tourists in Paris who resent it when the locals don’t speak English. A tourist bureau can help make the locals more friendly to tourists, but there are limits to how much a culture can be translated. So we need to value what the church has always valued and bring out the best of what is old. So good liturgy is created by taking in proper measure something old and something new. Which means we are already acquainted with blended worship. Think about it. Let’s say you play a Caesar Franck chorale for a prelude, the choir sings an anthem by Palestrina and one by Virgil Thompson, the offertory is “Rhosymedre” by Ralph Vaughan Williams, and the hymn texts are by Michael Praetorius, Isaac Watts and Carl Dawe. That can take place within the most ordered liturgy and it is still utilizing musical and textual materials from several centuries, countries, styles and traditions. In other words we do it all the time. The question then becomes, not whether we do it, but how do we do it so that it has integrity for Christian worship? What criteria do we use? New or old, does it create that alternative world to the world of the Empire? In other words, is it a song of Zion? Or is it just Babylonian? Does it tell the old, old story of Jesus and his love, even if it does it in a new, new way? Can it bring people to faith, to devotion, to worship? Can it warm hearts and change lives? In other words, the task of choosing our song for the new century takes spiritual discernment. It is a task that takes thought and prayer, knowledge and skill, an appreciation for scripture and tradition and an openness to the creative process. It is a task too important to be left to ministers alone or musicians alone but demands collaboration and collegiality. What is at stake is nothing less than how we see and hear the world which God loves and for which Christ died. You are a church musician. At some time in your life you were moved to do this. It may have been a long time ago and you may be tired—tired from living in Babylon, speaking Babylonian, even singing Babylonian songs. I am here to remind you that you are a citizen of Zion. You have glimpsed her walls, worshipped in her temple, heard her songs. Don’t forget who you are, even if remembering Zion sometimes makes you weep. Don’t forget who you are! Because if you forget, and I forget, musicians and clergy, who will sing the songs of Zion to our children? No one! They will learn only Babylonian. So that is how you know what song to sing. It can be something old, or it can be something new, but sing me one of the songs of Zion. Amen. A Sermon preached on July 27, 1998 at the United Church Musicians Conference. Trinity Church Retreat Center, Cornwall, Connecticut.